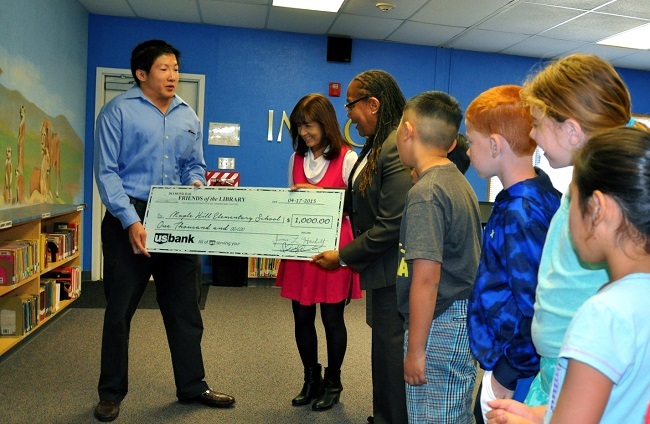 Diamond Bar Friends of the Library President Chris Ko presented $1,000 to the Maple Hill library. Maple Hill Elementary’s Library Media Center will be getting lots of new books thanks to a generous donation from the Diamond Bar Friends of the Library. Board members from the non-profit presented a check for $1,000 to fund titles from the school’s “wish list” on April 17. “We have established a new book fund that we are implementing for public schools in Diamond Bar,” announced President Chris Ko. Maple Hill received the first gift from the organization. The wonderful new library that opened in late February was created from two connecting portables with fiction and non-fiction spaces. A grassroots campaign funded new carpet, paint, furniture, ceiling tiles, and shelving for the library. “It was all a school effort with lots of support from our parents and community,’ said Principal Nancy Stingley. The renovation wasn’t part of the school modernization plan. Maple Hill 82-year-old grandfather and artist Cor Grieve painted vivid murals making the library a one-of-a kind reading sanctuary. He’s added 10 paintings around the campus in the past two years. Lions, zebras, and giraffes roam in the African Savanna depicted in the non-fiction room. Across the library, fictional characters Clifford, Arthur, Winnie the Pooh, Little Red Ridding Hood, and Harry Potter decorate the walls. “They don’t want to leave!” confirmed Tuyet Van Nguyen, the school librarian. “It’s really a great place,” Diamond Bar Mayor Pro Tem and Friends’ Board Member Nancy Lyons commented during the tour. The Walnut Valley Unified School District is looking for citizens to serve on the Citizens’ Bond Oversight Committee. In November 2007, voters approved General Obligation Bond Measure S, the $64.6 million Academic Facilities Measure, and Measure Y, the $15.2 million Physical Education Facilities Measure. In 2008, Series A was released and Walnut Valley schools began receiving needed repairs and upgrades. Outdated classrooms are being modernized with new roofing, heating, ventilation and electrical wiring and advanced technology will continue to be sustained on every campus. School playgrounds, athletic fields and performing arts facilities are being improved, and in some cases built new as with Chaparral’s Gymnasium and Walnut High School’s Band Building, as well as an Aquatic Center and Classroom Building, which took place at Diamond Bar High School. An active oversight committee is part of the accountability and auditing process to ensure that a check and balance system is effective. The Committee consists of seven members appointed by the Board of Trustees from a list of candidates submitting written applications, and based on criteria established by Prop 39. In 2011, the District released Series B of Bond Measures S & Y which funded Cyrus J. Morris Elementary School’s modernization and Chaparral Middle School’s new Science Buildings. 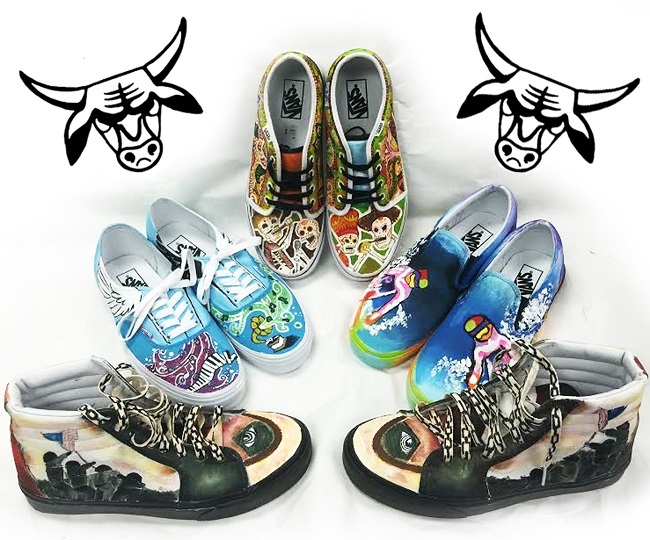 These projects are ongoing. In 2014, Vejar Elementary School’s lunch shade structure was complete as well as Maple Hill Elementary School’s ball wall. The District is now seeking applications to fill the expiring terms of seven committee members. The new members will serve a two-year term. A copy of the bylaws and an application form may be downloaded from the District’s website at www.wvusd.k12.ca.us. They are also available by email or fax. Anyone interested in obtaining an application may call Danielle Amaya-Martinez at (909) 595-1261 ext. 31329. All completed applications must be received in the Superintendent’s Office by Thursday, May 11, 2015, before 4:00 p.m.
On April 10, Newton Middle School, in Hacienda Heights, hosted their annual “Tea of celebration” that honored their GATE (Gifted and Talented) students for all of their hard work and dedication as they strive to give their best, academically, each day. The school has 183 sixth through eighth grade students in the GATE program. 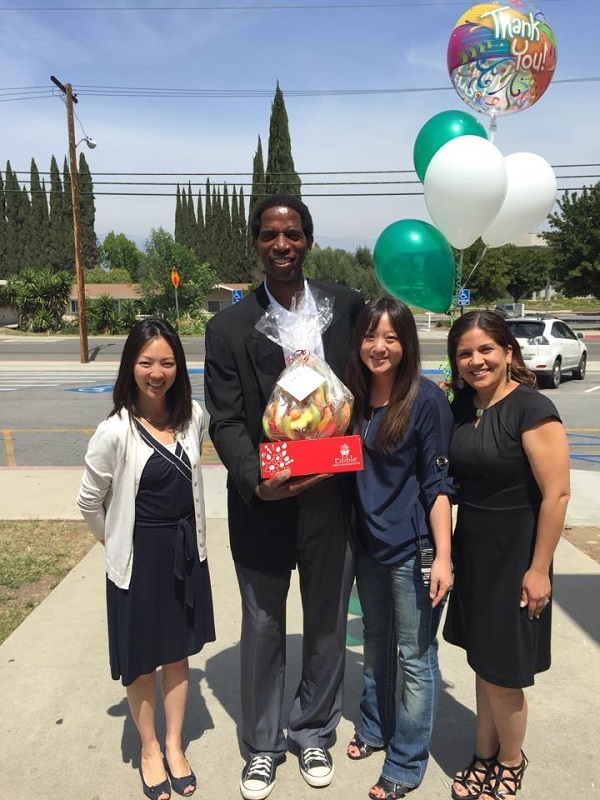 This year’s tea included AC Green, former Los Angeles Lakers legend and Luz Herrera, Assistant Dean at UCLA’s School of Law. As Green entered the school’s cafeteria, he was greeted by the students, staff,and parents who were all very eager to hear his message for the day. The students and staff sprung to life with excitement, cheering, and genuinely star-struck as he made his way to the front of the room. Herrera, the event’s second keynote speaker, also shared with the students two powerful messages of how important it is to excel in both academics as well to develop social relationships with others. She also stressed the importance of selecting a peer group that will be a supportive and positive influence in one’s life. Overall, it was a very fun, engaging, and educational event enjoyed by all, followed by an array of light refreshments, served by the staff. Pomona Unified’s fledgling Palomares Academy of Health Sciences has joined the elite ranks of schools awarded the prestigious “Distinguished” designation by the National Academy Foundation, a recognition of the strength of the school’s program for preparing students for success in college and careers. Just seven of National Academy Foundation’s network of 667 schools were added this year to its roster of “Distinguished” campuses for a total of 28 – less than 5 percent. It is the foundation’s highest level of achievement, based on an annual assessment that showed “exceptional fidelity” to its educational model. Palomares, which opened a scant seven years ago as a grade 7-12 academy, is graduating its second class of seniors this June. Last year, 100 percent of its first senior class was accepted to four-year universities. “This is a tremendous honor that recognizes not only the forward-thinking approach Pomona Unified takes to provide students with educational opportunity, but one that stands as a proud testament to the dedication, talent and determination of our educators,” said Board of Education President Andrew Wong. The foundation’s system focuses on preparing underserved populations for college and careers in specific industries – finance, hospitality and tourism, information technology and health sciences. Under the model, students take rigorous, career-focused courses tied to real-world opportunities with business professionals. 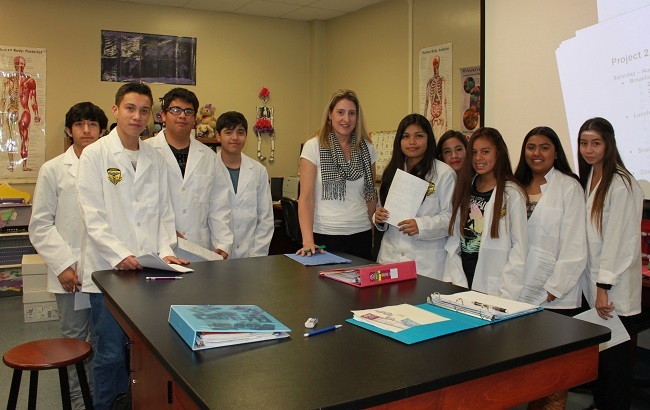 Palomares provides an education focus on health sciences for a community that is primarily English learners, socio-economically disadvantaged students and students with disabilities. The school features project-based learning and a rigorous STEM curriculum. Students attend workshops at Western University of Health Sciences, work at Pomona Valley Hospital and showcase their skills at health fairs. Palomares Academy will be recognized at “NAF Next,” NAF’s annual professional development conference in Anaheim in July. “The success of our program at Palomares validates our approach to transforming Pomona Unified into a model for 21st century learning – a place where students can find their path to the future regardless of any challenges or barriers,” said Pomona Unified Superintendent Richard Martinez. Mt. San Antonio College students Candice Handjojo and Andrew Pastor are two of the 92 community college students throughout the state recently selected for the 2015 All-California Academic teams, chosen by Phi Theta Kappa (PTK), the international community college honor society. These students represent some of the best of the 2.8 million students enrolled in California’s community college system. Handjojo and Pastor, both students in Mt. SAC’s Honors Program, received medallions during the Community College League of California’s awards ceremony held on April 7 at the Sheraton Grand in Sacramento. Selection for the academic teams is based on grades, leadership, and community service. Handjojo, 20, is a sociology major and carries a 3.94 GPA. She was selected for the All-California Academic Third Team. A West Covina resident, she volunteers as tutor for Schools on Wheels tutoring that provides tutoring services for homeless children and also tutors second-grade children in English, science, and math through Top Kids in Walnut. In addition, she volunteers as a score keeper for National Junior Basketball for area youth. She sang as a member of Mt. SAC’s concert choir and sings with her church choir in West Covina. She plans to transfer to UC Berkeley or UC Irvine as a sociology major, and eventually become an educational counselor. Pastor, 20, is a public health major and carries a 4.0 GPA. He was selected for the All-California Academic Third Team. A San Dimas resident, he served as president of the Honors Ambassadors for PTK on campus. He is a member of the Caduceus Club and the Native American Intertribal Student Association (NAISA) at Mt. SAC, and is a tutor at the college’s Learning Assistance Center. Off campus, he is a percussion instructor at San Dimas High School and is serving an internship with UC Irvine’s Medical Center. He plans to transfer to UC San Diego, UC Berkeley, or UC Irvine as a public health/microbiology major. He eventually plans to become a physician and work as a global health coordinator. There are 30 first-team, 31 second-team, and 31 third-team winners. For the 17th year, Mt. San Antonio College will have the only stage in the world where you can see stars such as Dean Martin, Judy Garland, Queen, David Bowie, and Pharrell Williams together in one show as the Mt. SAC Faculty Association sponsors its annual scholarship fundraiser, “Puttin’ on the Hits.” Show times are Friday, April 24, at 7:30 p.m., and Saturday, April 25, at 3 and 7:30 p.m., in the Clarke Theater. Mt. SAC professors, managers, staff, and students in authentic costumes will impersonate famous celebrities and lip sync their hit tunes. The program showcases several styles of music, including country, swing, R & B, hip-hop, and rock ‘n’ roll. Last year, the Faculty Association provided over $15,000 for student scholarships. Over its history, “Puttin’ on the Hits” has raised more than $125,000 for scholarships. Tickets are $25 and up for general admission and $15 for students with student ID. 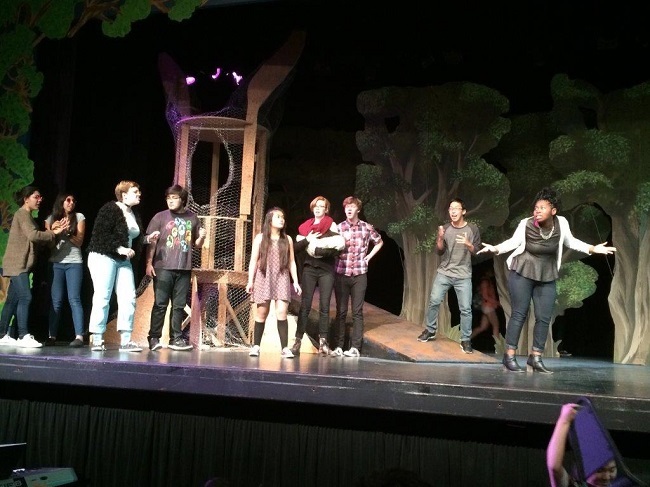 For tickets and more information, call the Performing Art Box Office at (909) 274-2050. Tickets may also be purchased online atwww.tickets.mtsac.edu. 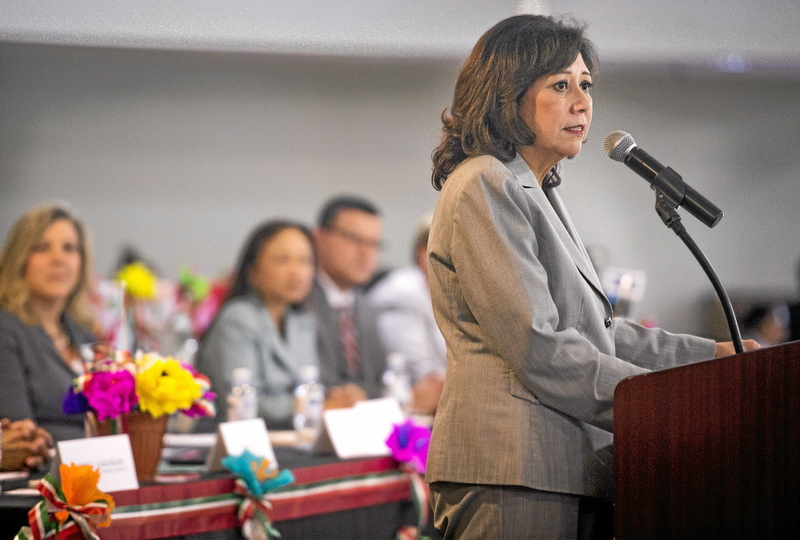 Los Angeles County Supervisor Hilda Solis joined business and community leaders Wednesday in the Principal for the Day program in the Bassett, Rowland and Hacienda La Puente school districts. Growing up, Solis never expected to have the opportunities she has had. She credited local schools with giving her a good start. “There were people in the school system that helped to direct me, to motivate me but also to give me the inspiration to go on,” Solis said. After graduating from Cal Poly Pomona, Solis earned a Master’s Degree in Public Administration from USC. Solis worked for President Jimmy Carter in the White House Office of Hispanic Affairs. Later, she became a management analyst in the Civil Rights Division. Ten high school and two adult education students received scholarships for their outstanding achievements. Solis called adult education and Regional Occupational Programs very important to the economy. “It’s about the economic development, about education and continuing to open up a career path for all of us,” Solis said.